The program offers the opportunity to achieve a high level of engineering and business understanding within a globally successful engineering company. The graduate training program will take place in Bologna over a 2 year period, starting in March 2015, after which the graduates will join international subsidiaries around the Maccaferri world. 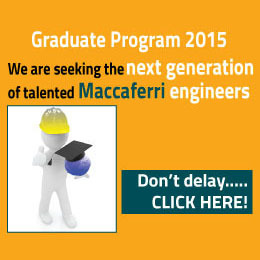 For the 2015 Graduate Program, Maccaferri is seeking candidates from: Italy, Germany, South Africa, Canada (or USA), Turkey, Russia and China. Previously successful candidates have been civil, geotechnical or environmental engineering graduates, or have an allied degree, in order to understand and exploit fully the market sectors in which Maccaferri operates. These candidates from the 2013 Graduate Program are currently working in Maccaferri offices in as diverse locations as Mexico, Philippines, Russia, India and the USA. The training program focusses on the four key areas of interest; Double twist mesh products for retaining walls, hydraulic works and soil reinforcement; rockfall and natural hazard mitigation solutions; geosynthetic solutions and vertical walls. After general product and solution training, the candidates’ knowledge will be expanded through job shadowing and on-the-job training, focusing on project development. Finally, the candidates will specialize in specific solution areas and familiarize themselves with their destination Maccaferri subsidiary and marketplace. Following this period of intense training, the candidate will then be assigned to one of two differing roles according upon the needs of the Maccaferri subsidiary, candidate aptitude and knowledge. The job will be located within the local subsidiary. The Candidate will work with Consulting engineers and design firms to develop “first sale” activity, and with Contractors for the “second sale” activity, taking full responsibility for the Technical Proposals prepared under the control of the Technical Manager of the subsidiary. Technical assessments will include preliminary design, geotechnical and hydraulic assessments, structural stability checks and preparation of preliminary drawings using AutoCAD. The Candidate will be expected to visit Clients and to prepare Commercial Proposals working in close cooperation with the Technical Department and the Sales Manager of the local subsidiary to which they are assigned. Proposals will present the Maccaferri company and detail the suitable engineering applications, solution benefits, product characteristics, case histories and past experience. Although a Civil Engineering degree with special attention to geotechnics, hydraulics and civil structures is preferred, candidates with other allied engineering degrees will be considered. Candidates with ERASMUS experience will be favourably considered. The Candidate should have experience (either through university studies or related job experience), geotechnics, hydraulics, structures and coastal protection. Job experience is not necessary but will be evaluated if relevant for the field of activity of Maccaferri. As Maccaferri is a business operating globally, English knowledge at B2 level (CEFR) is mandatory, and knowledge of a second language (French, Spanish, German, Arabic, Mandarin) will be positively evaluated. For more details download the Job Description, or visit our LinkedIn page. You can apply directly via e.mail (Group.HR@maccaferri.it).